Born August 2, 1949 in Groningen, Netherlands. After kicking the ball around in the streets for a couple of years, Bill joined the Lycurgus S.V. when he was eight years old and played in their program until he moved to the United States in 1964. He joined the Vikings S.C. for a year, In 1965 he joined Hollandia S.C., followed by two years with S.C. Berlin, during which time he also played at South High School (‘66-’68) and was named to the High School State All-Star Team in each year. In 1968 he once again joined up with Hollandia S.C. until 1972 when Bill and his friends formed Pan World F.C. He served as their president from 1973-’90 and their club’s dominance with the men’s team being voted 'Club of the Decade 1975-1984' and their women’s team being voted 'Club of the Decade 1985-1994' made them the most prolific club in the first one hundred years of the Utah Soccer Association by winning fifteen State Championships between the two teams. Furthermore, he served as commissioner of the Utah High School Soccer Association from 1970-’82 and also attained his State badge as a USSF grade 5 referee in 1982. He retired from officiating in 1991. 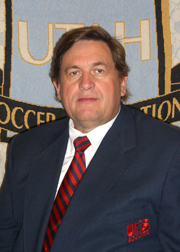 Bill became president of the Utah Soccer Association in 1986, which position he still retains. Through his work with other State Associations, U.S. Adult Soccer Association (USASA) and the United States Soccer Federation (USSF), Bill has been ambassador for the Utah Soccer Association while serving in a number of capacities for the USASA, amongst which he was the USASA National Select Teams Program Chairman for fifteen years, elected as USASA-Region IV Deputy Director followed by being elected as the Regional Director in 2005 until 2011 when he was elected as the Vice President of the USASA and is currently serving as a member of the USASA Board of Directors since 2002. In 2007 he also became a member of the USASA National Hall of Fame. In addition. he has served on several committees for the USSF, including duties as head of delegation for various US National Teams and being a member of the USSF Board of Directors from 2005-2007 and 2011 to 2014.